The enigma: how does the lung branch millions of times over, first stereotypically and then non-stereotypically to make a large enough and thin enough surface area to support respiratory gas exchange? Lung morphogenesis is stereotypic, both for lobation and for the first several generations of airways, implying mechanistic control by a well conserved, genetically hardwired developmental program. This program is not only directed by transcriptional factors and peptide growth factor signaling, but also co-opts and is modulated by physical forces. Peptide growth factors signal within repeating epithelial-mesenchymal temporospatial patterns that constitute morphogenetic centers, automatically directing millions of repetitive events during both stereotypic branching and nonstereotypic branching as well as alveolar surface expansion phases of lung development. Transduction of peptide growth factor signaling within these centers is finely regulated at multiple levels. These may include ligand expression, proteolytic activation of latent ligand, ligand bioavailability, ligand binding proteins and receptor affinity and presentation, receptor complex assembly and kinase activation, phosphorylation and activation of adapter and messenger protein complexes as well as downstream events and cross-talk both inside and outside the nucleus. Herein we review the critical Sonic Hedgehog, Fibroblast Growth Factor, Bone Morphogenetic Protein, Vascular Endothelial Growth Factor and Transforming Growth Factorβ signaling pathways and propose how they may be functionally coordinated within compound, highly regulated morphogenetic gradients that drive first stereotypic and then non-stereotypic, automatically repetitive, symmetrical as well as asymmetrical branching events in the lung. Lung morphogenesis is stereotypic, both for lobation of the lungs and for the first 16 of 23 generations in humans. The latter phase of lower airway branching and on into the alveolar surface folding and expansion phase is nonstereotypic, but nevertheless follows a recognizable, proximal-distal fractal pattern that is repeated automatically at least 50 million times. This morphogenetic program drives the formation of an alveolar gas diffusion surface 0.1 micron thick by 70 square meters in surface area that is perfectly matched to the alveolar capillary and lymphatic vasculature . Murine genetics and organ culture experiments, as well as comparative studies in the fly, have revealed that the stereotypic branch pattern of the respiratory organs is determined by a well-conserved, genetically hard-wired program directed by transcriptional factors, that interact in a coordinated manner with peptide growth factor signaling pathways as well as hypoxia and physical forces [1–4]. Transduction of candidate growth factor peptide ligand signals can be regulated at many levels. These may include ligand expression, proteolytic activation of latent forms of ligand, ligand binding to matrix bound and/or soluble inhibitors, as well as ligand binding to receptor presentation molecules outside the cell. On the cell surface and within the cell, receptor assembly, kinase activation, and phosphorylation and activation of adapter and messenger protein complexes activate downstream signaling pathways both within and without the nucleus, including the induction of pathway specific inhibitors. Thus, peptide growth factor signaling is finely coordinated to regulate such essential morphogenetic functions as gene expression, cell cycle progression and cell migration, cytodifferentiation and matrix deposition in the lung. The purpose of this selective review is to place key examples of the regulatory mechanisms that mediate growth factor signaling into the general context of lung morphogenesis. We will discuss selected examples of these finely balanced regulatory mechanisms and propose how they may be functionally coordinated within compound, highly regulated morphogen gradients to drive first stereotypic and then non-stereotypic, automatically repetitive, symmetrical as well as asymmetrical branching events in the lung. Those growth factors that have been studied most intensively in lung development include Epidermal Growth Factor (EGF), Fibroblast Growth Factor (FGF), Hepatocyte Growth Factor (HGF) and Platelet-Derived Growth Factor (PDGF). These peptide growth factors signal through cognate transmembrane tyrosine kinase receptors to exert a positive effect on lung morphogenesis. In contrast, growth factors such as Transforming Growth Factor (TGF) β family peptides, which signal through transmembrane serine-threonine kinase receptors, exert an inhibitory effect on lung epithelial cell proliferation and hence negatively regulate lung morphogenesis. However, recently, TGFβ isoform-specific null-mutants show that the latter generalization may not be entirely correct. Moreover, Bone Morphogenetic Protein (BMP) 4 appears to exert a complex negative or positive regulatory influence, depending on whether mesenchymal signaling is intact. Sonic Hedgehog (SHH) family peptide signaling represents another special case. The SHH cognate receptor, patched (PTC), exerts a negative effect on SHH signaling both through the release of the transcriptional repressor Smoothened (SMO) and the induction of the Hedgehog interacting protein (Hip). Peptide growth factors in the embryonic lung are expressed in repeating patterns in morphogenetic centers that surround and direct each new branch tip. Mesenchymally expressed morphogenetic genes include Fgf10, Sprouty4 (Spry4), patched, smoothened, Wnt and Hox family members. While Bmp4, Shh, mSpry2 and Smads 2, 3 and 4 are expressed in the adjacent epithelium. The interactions of subsets of these ligand signals, particularly SHH, BMP4 and FGF10 have been extensively reviewed recently and several models have been proposed to explain how they may interact to induce and then regulate epithelial branching morphogenesis [1–3, 5]. In general, these models propose that FGF10, which is expressed focally in embryonic lung mesenchyme adjacent to stereotypically determined branching sites, acts as a potent chemoattractant to epithelium. Whether this results in a monochotomous or dichotomous branching event, likely depends on additional factors as well, such as the organization of the overlying matrix . However, since FGFR2IIIb, which is the principal and highest affinity FGF10 receptor, is expressed widely throughout the epithelium, the question arises as to how the ligand signal can become stereotypically localized. SHH and BMP4 have been proposed as candidate ligands to play a role in defining the expression and function of FGF10, while Sprouty2 (SPRY2) has been proposed as an inducible negative regulator of FGF signaling (Figure 1). Growth factor interactions during lung bud outgrowth and lung bud arrest. In the left hand panel, a bud is beginning to extend. Fibroblast Growth Factor 10 (FGF10) expression is shown as a clump of green mesenchymal cells that chemoattracts the epithelium, shown in brown, towards the pleura shown in white. Sonic hedgehog (SHH) is expressed at low levels, which facilitates the chemotactic activity of FGF10. Bone Morphogenetic Protein 4 (BMP4) also plays key roles in bud extension. In the right hand panel, the bud has extended and is undergoing bud arrest. FGF10 has induced Sprouty2 (SPRY2) expression in the epithelium to a high level, which inhibits further chemotaxis in response to FGF10 signaling. BMP4 is also induced at a higher level and inhibits cell proliferation and hence bud extension. SHH acts through Patched (PTC), to negatively regulate Fgf10 expression in the mesenchyme near the bud tip. 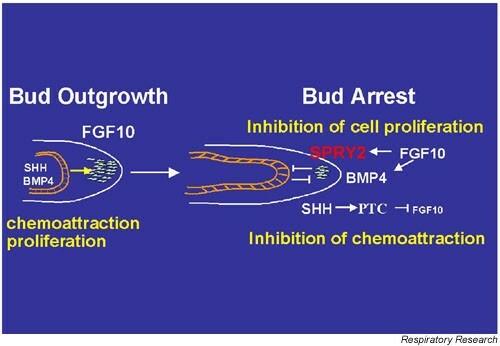 The net result is inhibition of cell proliferation and chemoattraction, culminating in bud arrest. SHH, which is expressed throughout the epithelium is postulated to suppress Fgf10 expression and hence prevent branching events at sites where branching is stereotypically determined not to take place. This supposition is based on the finding that Fgf10 expression is not spatially restricted in the Shh null mutant mouse lung. Moreover, the local suppression of SHH signaling by the induction of Ptc and Hip at branch tips may serve to facilitate FGF signaling locally where branch outgrowth is stereotypically programmed to take place. The role of BMP4, which is expressed predominantly in the epithelium and is increased at branch tips, until recently was postulated to be the localized suppression of epithelial proliferation, thus, providing a negative modulatory influence on FGF signaling to mediate arrest of branch extension and hence to set up branch points. This hypothesis was based upon the hypoplastic phenotype of the epithelium in transgenic misexpression studies of Bmp4 in the epithelium, as well as upon addition of BMP4 ligand to naked epithelial explants in culture. However, two groups have now shown that BMP4 is actually a potent stimulator of branching in the presence of mesenchyme and at physiologic concentrations in lung explants. Moreover, the effects of BMP4 are in turn negatively modulated by the BMP binding proteins Gremlin and Noggin. Therefore it seems unlikely that BMP4 signaling merely serves to inhibit epithelial proliferation, particularly since BMP4 specific Smads 1, 5 and 8 are predominantly expressed in the mesenchyme away from the epithelium. BMPs have also been reported to control differentiation of the endoderm along the proximal-distal axis . Inhibition of BMP signaling at the tip of the lung bud by over-expression in the distal epithelium of Noggin (a secreted inhibitor of BMPs) or of a dominant negative form of the Bmp type I receptor, activin receptor-like kinase 6 (Alk6), results in a distal epithelium exhibiting differentiation characteristics, at the molecular and cellular level, of the proximal epithelium. A further puzzle in early lung morphogenesis is the role of the vasculature and Vascular Endothelial Growth Factor (VEGF) signaling, since vascularization must perfectly match epithelial morphogenesis to ensure gas exchange. Several VEGF isoforms are expressed in the developing epithelium, whereas their cognate receptors are expressed in and direct the emergence of developing vascular and lymphatic capillary networks within the mesenchyme. It is possible that VEGF signaling may lie downstream of FGF signaling, since in vivo abrogation of FGF signaling severely affects both epithelial and endothelial morphogenesis. Later on in postnatal lung development, null mutation studies have revealed essential roles for PDGF-A chain and for FGFR3 and FGFR4 in induction of alveolar ridges and the correct orientation of elastic fibers in the postnatal lung. Following delivery, particularly premature delivery, exposure to endotoxin, oxygen and/or barotrauma, with the resulting induction of cytokines including excessive amounts of TGFβ, adversely affect alveolarization and can frequently induce interstitial fibrosis, a human pathobiological condition termed bronchopulmonary dysplasiaor infantile chronic lung disease. The role of SHH signaling in lung morphogenesis has recently been reviewed . Hedgehog signaling is essential for lung morphogenesis since Shh null mutation produces profound hypoplasia of the lungs and failure of tracheo-esophageal septation [9, 10]. However, proximo-distal differentiation of the endoderm is preserved in the Shh null mutant, at least in so far as expression of surfactant protein-C (SP-C) and Clara cell protein 10 (CC10) are concerned. The expression of the SHH receptor, Patched, is also decreased in the absence of Shh as are the Gli1 and Gli3 transcriptional factors. On the other hand lung-specific misexpression of Shh results in severe alveolar hypoplasia and a significant increase in interstitial tissue . Fgf10 expression, which is highly spatially restricted in wild type, is not spatially restricted and is widespread in the mesenchyme in contact with the epithelium of the Shh null mutant mouse lung. Conversely, local suppression of SHH signaling by the induction of Ptc and Hip at branch tips may serve to facilitate FGF signaling locally, where branch outgrowth is stereotypically programmed to take place . It is interesting to note that the cecum, which forms as a single bud from the mouse midgut and does not branch, also expresses Fgf10 throughout its mesenchyme (Burns and Bellusci, unpublished results). Thus, temporospatial restriction of Fgf10 expression by SHH appears to be essential to initiate and maintain branching of lung. The mouse embryonic lung represents a uniquely useful system to study the genes involved in bud outgrowth and bud arrest (Figure 1) [11, 13–17]. FGF10 promotes directed growth of the lung epithelium and induces both proliferation and chemotaxis of isolated endoderm [14, 16]. The chemotaxis response of the lung endoderm to FGF10 involves the coordinated movement of an entire epithelial tip, containing hundreds of cells, toward an FGF10 source. How this population of cells monitors the FGF gradient and which receptors trigger this effect remains unknown. FGF10 also controls the differentiation of the epithelium by inducing Surfactant Protein C (SP-C) expression and by up-regulating the expression of BMP4, a known regulator of lung epithelial differentiation [13, 18, 19, 16]. In vitro binding assays have shown that FGF10 acts mostly through FGFR1b and FGFR2b . While there is good evidence that FGF10 acts through FGFR2b in vivo, there are as yet no conclusive data involving FGFR1b (or any other receptor) in vivo. The biological activities mediated through these two epithelial receptors are likely to be different as FGF7 (acting mostly through FGFR2b) exhibits a different activity compared to FGF10 . 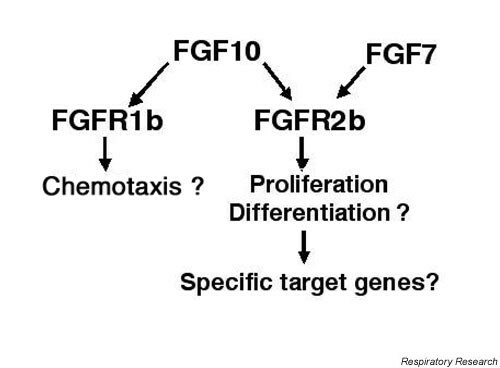 This hypothesis is also supported by our recent findings showing that Fgf10 -/- lungs exhibit a more severe phenotype than Fgfr2b -/- lungs (Figure 2). Potential interactions between Fibroblast Growth Factor7 (FGF7) and Fibroblast Growth Factor10 (FGF10) and cognate FGF receptors (FGFR1b and FGFR2b). FGF10 can activate both FGFR1b and FGFR2b. On the other hand, FGF7 only activates FGFR2b. Activation of FGFR1b by FGF10 may be responsible for chemotaxis, while epithelial cell proliferation and differentiation is mediated by both FGF10 and FGF7 activation of FGFR2b. This is mediated downstream by activation of specific target genes. The mammalian Fgf receptor family comprises four genes (Fgfr1 to Fgfr4), which encode at least seven proto-type receptors. Fgfr1, 2 and 3 encode two receptor isoforms (termed IIIb or IIIc) that are generated by alternative splicing, and each binds a specific repertoire of FGF ligands . FGFR2-IIIb (FGFR2b) is found mainly in epithelia and binds four known ligands (FGF1, FGF3, FGF7 and FGF10), which are primarily expressed in mesenchymal cells. Peters et al. reported the first evidence of a key role for Fgfr2 during lung development . They showed that mis-expression of a dominant negative form of Fgfr2 in the embryonic lung under the SP-C promoter led to a severe reduction in branching morphogenesis. Further evidence came from Fgfr2 inactivation in the embryo. While mice null for the Fgfr2 gene die early during embryogenesis, those that are null for the Fgfr2b isoform, but retain Fgfr2c, survive to birth [22–25]. Mice deficient for Fgfr2b show agenesis and dysgenesis of multiple organs, including the lungs, indicating that signaling through this receptor is critical for mesenchymal-epithelial interactions during early organogenesis. This idea is supported by the recent finding that prenatally induced misexpression of a dominant negative FGFR, to abrogate FGF signaling, results in a hypoplastic, emphysematous lung phenotype . In contrast, induced abrogation of FGF signaling postnatally did not produce any recognizable phenotype. The FGF family is comprised of at least 23 members, many of which have been implicated in multiple aspects of vertebrate development (for review see ). In particular, FGF10 has been associated with instructive mesenchymal-epithelial interactions, such as those that occur during branching morphogenesis. In the developing lung, Fgf10 is expressed in the distal mesenchyme at sites where prospective epithelial buds will appear. Moreover, its dynamic pattern of expression and its ability to induce epithelial expansion and budding in organ cultures have led to the hypothesis that FGF10 governs the directional outgrowth of lung buds during branching morphogenesis . Furthermore, FGF10 was shown to induce chemotaxis of the distal lung epithelium [16, 28]. Consistent with these observations, mice deficient for Fgf10 show multiple organ defects including lung agenesis [29–31]. FGF10 is the main ligand for FGFR2b during the embryonic phase of development as evidenced by the remarkable similarity of phenotypes exhibited by embryos where these genes have been inactivated [17, 24, 31]. The paradigm proposed so far is that FGF10 expressed by the mesenchyme acts on the epithelium (which expresses FGFR1b and 2b). However, a recent report by Sakaue et al. suggests that FGF10 expressed in the fat pad precursor of the developing mammary gland from embryonic day 15.5 (E15.5) onwards could act in an autocrine fashion to induce the differentiation of adipocytes from the fat pad precursor, but the specific receptors involved are unknown [17, 32]. In Drosophila melanogaster, Branchless (bnl), the Drosophila counterpart of FGF10, has been involved in the directional growth of the ectoderm-derived cells from the tracheal placode . Bnl expressed by the cells surrounding the placode acts on the ectoderm expressing the Fgfr2b ortholog, breathless (btl). An additional unsuspected function of bnl in the development of the male genital imaginal disc has been recently reported . Here, FGF signal expressed by ectoderm-derived cells of the male genital disc induces the FGFR-expressing mesodermal cells to migrate into the male disc. These mesodermal cells also undergo a mesenchymal to epithelial transition. The authors suggest that bnl, the FGF10 ortholog, is likely to be involved in this process. Thus, FGF10 is a multifunctional growth factor and additional roles for FGF10 in lung development likely remain to be identified. The role of inhibitory regulators in the formation of FGFR activated signaling complexes during respiratory organogenesis remains incompletely characterized. The first example of an FGF inducible signaling antagonist arose from the discovery of the sprouty mutant during Drosophila trachea development, in which supernumerary tracheal sprouts arise. In the Drosophila tracheae, bnl binds to btl, inducing primary, secondary and terminal branching. The function of bnl is inhibited by Sprouty (Spry), a downstream effector in the bnl pathway . Spry feeds back negatively on bnl, thereby limiting the number of sites at which new secondary tracheal buds form. Spry is not only found downstream in the FGFR pathway, but also appears to be an inhibitor of other tyrosine kinase signaling pathways such as EGF and Torso . Mice and humans possess several Spry genes (mSpry1-4 and hSPRY1-4). mSpry2 is the gene that is most closely related to Drosophila Spry and is 97% homologous to hSpry2. mSpry2 is localized to the distal tips of the embryonic lung epithelial branches and is down regulated at sites of new bud formation . On the other hand, mSpry4 is predominantly expressed throughout the distal mesenchyme of the embryonic lung. Abrogation of mSpry2 expression stimulates murine lung branching morphogenesis and increased expression of specific lung epithelial maturation/differentiation markers . Conversely, over-expression of mSpry2 under the control of a SP-C promoter or by intratracheal microinjection of an adenovirus containing the mSpry2 cDNA, results in smaller lungs with a particular "moth-eaten" dysplastic appearance along the edges of the lobes, with decreased epithelial cell proliferation . Thus, not only is the function of Spry conserved during respiratory organogenesis, but also as seen by loss of function and gain of function studies, Spry plays a vital role in regulating lung branching morphogenesis. In Drosophila, in vitro co-precipitation studies show that Spry binds to Gap1 and Drk (a Grb2 orthologue), resulting in inhibition of the Ras-MAPK pathway . Upon further investigation of the mechanism by which mSPRY2 negatively regulates FGF10 in mouse lung epithelial cells (MLE15) we recently determined that mSPRY2 differentially binds to FGF downstream effector complexes (; Figure 3). Sprouty is a rapidly inducible negative regulator of fibroblast growth factor (FGF) pathway signaling. The figure shows a model describing the interaction of murine Sprouty2 (mSPRY2) with other key signaling proteins in the FGF signaling pathway. 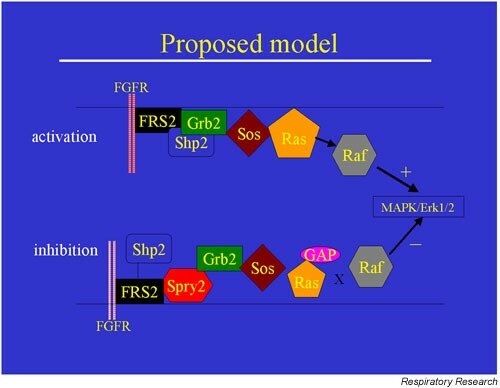 In the upper panel, the FGF pathway is shown signaling the activation of MAP kinase/ERK2 via the FGFR, FRS2, Shp2, Grb2, Sos, Ras and Raf pathway. In the lower panel Sprouty2 (SPRY2) is shown binding FRS2 and Grb2 and displacing Shp2 from FRS2 and Grb2, thereby preventing subsequent activation of the Sos, Ras-GAP, Raf pathway, resulting in net inhibition of MAP kinase/ERK2 activation. FGFRs are different from other tyrosine kinase receptors in that they require adapter or docking proteins including phospholipase C γ, Shc, FRS2 and various others to recruit the Grb2/Sos complex upon stimulation. Stimulation of FGFR not only results in formation of the FRS2/Grb2/Sos complex, but the binding of a positive tyrosine phosphatase regulator, Shp2, to FRS2, which is required for full potentiation of MAP-kinase activation . Complex formation leads to catalyzation of GDP to GTP on Ras, which is required for Raf (serine/threonine kinase) activation. Raf causes direct activation of ERK, leading to phosphorylation of cytoplasmic proteins followed by cell growth and differentiation . We found that in the native state mSPRY2 associates with Shp2 and Gap, which is a GTPase-activating protein that hydrolyzes GTP to GDP. It is possible that in this state the binding of Shp2 to mSPRY2 regulates mSPRY2 activity. Upon FGFR activation, mSPRY2 disassociates from Shp2 and Gap and translocates to the plasma membrane, where it binds to both FRS2 and Grb2, thus blocking the formation of the FRS2/Grb2/Sos complex, resulting in a net reduction of MAP-kinase activation (Figure 3). Thus, Sprouty would inhibit the formation of specific signaling complexes downstream from tyrosine-kinase receptors resulting in modulation and co-ordination of cell growth and development during organogenesis. It is interesting to note, that overexpression of Spry in chick limb buds results in a reduction in limb bud outgrowth that is consistent with a decrease in FGF signaling . This suggests a possible co-regulatory relationship between FGF signaling and Spry during development. In further support of this model, Spry4 inhibits branching of endothelial cells as well as sprouting of small vessels in cultured mouse embryos. Endothelial cell proliferation and differentiation in response to FGF and VEGF are also inhibited by mSpry4, which acts by repressing ERK activation. Thus, Spry4 may negatively regulate angiogenesis . It has been suggested that both Spry2 and Spry4 share a common inhibitory mechanism. Both Sprouty translocate to membrane ruffles upon EGF stimulation. However, only SPRY2 was shown to associate with microtubules . The C-terminus of hSPRY2 has been shown to be important for modulation of cellular migration, proliferation and membrane co-localization [42, 43]. Interestingly, the C-terminus is the region that is most conserved throughout the Spry family, and contains potential regulatory sites that would modulate Spry activity. Spry has also been shown to interact with c-Cbl resulting in increased EGFR internalization . Although Spry is not a specific inhibitor to the FGFR signaling pathway nor to respiratory organogenesis, it appears that Spry plays a vital role in modulating several signaling pathways in order to limit the effects of excessive growth factor receptor tyrosine kinase signaling. Several BMPs, including BMP3, 4, 5 and 7, are expressed during embryonic lung development [13, 45, 46]. The expression of Bmp5 and Bmp7 has been detected in the mesenchyme and the endoderm of the developing embryonic lung respectively, while Bmp4 expression is restricted to the distal epithelial cells and the adjacent mesenchyme [13, 46]. 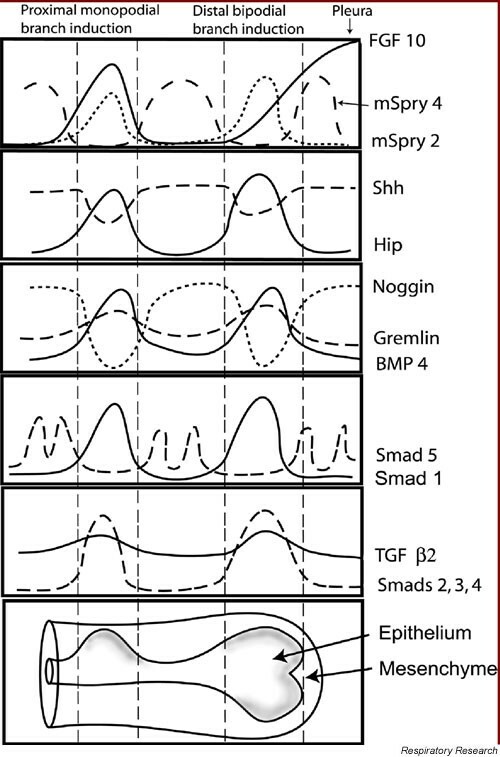 Most of the BMP signaling pathway components, such as BMP receptors (type II and type I: ALK2, 3, and 6) and BMP specific receptor-regulated Smads (R-Smads), including Smad1, 5, and 8, are expressed in early mouse embryonic lung [47, 48]. Overexpression of Bmp4, driven by the SP-C promoter in the distal endoderm of transgenic mice, causes abnormal lung morphogenesis, with cystic terminal sacs and inhibition of epithelial proliferation . In contrast, SP-C promoter-driven overexpression of either the BMP antagonist Xnoggin or a dominant negative Alk6 BMP receptor to block BMP signaling, results in severely reduced distal epithelial cell phenotypes and increased proximal cell phenotypes in the lungs of transgenic mice . However, the exact roles of BMP4 in early mouse lung development remain controversial. In isolated E11.5 mouse lung endoderm cultured in Matrigel™ (Collaborative Biomedical products, Bedford, MA, USA), addition of exogenous BMP4 inhibited epithelial growth induced by the morphogen FGF10 . However, addition of BMP4 to intact embryonic lung explant culture stimulates lung branching morphogenesis [49, 50]. Recently, parallels have been drawn between genetic hard wiring of tracheal morphogenesis in Drosophila melanogaster and mammals . Dpp, the Drosophila BMP4 orthologue, has been reported to be essential for the formation of the dorsal and ventral branches of the tracheal system, controlling tracheal branching and outgrowth possibly through induction of the zinc finger proteins Kni and Knrl [51, 52]. Since conventional murine knockouts for BMP4 and BMP-specific Smads cause early embryonic lethality, their functions in lung development in vivo still need to be further defined. Interestingly, germ line mutations in BMP type II receptors were recently found in familial primary pulmonary hypertension . Therefore, BMPs may play multiple roles in lung development. All TGFβ superfamily members (TGFβs, activins and BMPs) produce their cellular responses through formation of heteromeric complexes of specific type I and type II receptors (reviewed in [54, 55]). The type II receptors are constitutively active kinases, which, upon ligand-mediated complex formation, phosphorylate particular serine and threonine residues in the type I receptor juxtamembrane region. This leads to activation of the type I receptor, which is thereby capable of transducing signals downstream. It has been shown that type I receptors are responsible for determining specificity within the heteromeric signaling complex. Seven type I receptors called activin receptor-like kinases (ALKs) have been discovered in mammals. ALK4 and ALK5 are receptors for activin and TGFβ, respectively, whereas ALK2, ALK3 and ALK6 are receptors for BMPs. Recently, ALK1 was shown to be an endothelial cell specific TGFβ receptor, while ALK7 has been suggested to mediate signals of another TGFβ-related ligand, nodal. Interestingly, among all TGFβ type I receptors, ALK2 shows the broadest spectrum of specificity. It has been shown to mediate BMP-signaling, but it also has been shown to act as a type I receptor for TGFβ, activin and Müllerian inhibitory substance [56–60]. ALKs, their ligands and expression in the midgestational lung have been summarized in Table 1. During embryonic days 12–14 (E12-E14), Alk5 and Alk4 are expressed predominantly in the lung mesenchyme and the epithelium, respectively . Alk2 and Alk6 are expressed in the lung epithelium. However, Alk6 expression is limited to the lung epithelium ( Kaartinen, unpublished results). It was recently suggested that the effect of TGFβ 2 on lung branching morphogenesis would be mediated by the TGFβ type II receptor – ALK5 complex. Thus, activins and therefore ALK4 would not have a significant role in this process . The role of ALK6 in pulmonary maturation was recently underscored by Weaver and coworkers, who showed that the BMP signaling mediated by these receptors regulates the proximal-distal differentiation of endoderm in mouse lung development . The role of ALK2 in epithelial differentiation and branching, if any, is yet to be determined. The complex process of vascular development involves vasculogenesis – de novo formation of blood vessels through the aggregation of endothelial cells – and angiogenesis – the growth of new blood vessels from a pre-existing vascular network . Several lines of evidence demonstrate that TGFβ-BMP signaling via ALKs plays a key role in the regulation of angiogenesis. It was recently shown that the TGFβ type I receptor, ALK5, plays a crucial role during vascular development by regulating endothelial cell proliferation, extracellular matrix deposition and migration . Loss-of-function mutations both in the human and mouse genes encoding Endoglin, a TGFβ binding protein, and in Alk1, cause hereditary hemorrhagic telangiectasia type 1 (HHT1) and type 2 (HHT2), respectively [64–68]. This disease affects blood vessel integrity and causes arteriovenous malformations of the lung. It has been suggested that ALK1 would function in establishment of arterial-venous identity, and that the balance between signals mediated by ALK1 and ALK5 is important in determining vascular endothelial properties during angiogenesis [68, 69]. Moreover, recent studies demonstrated that the TGFβ type II receptor, BMPRII, which is one, and maybe the principal binding partner of, ALK2, is mutated in primary pulmonary hypertension (PPH) . Histo-pathological findings of PPH include intimal fibrosis, in situ thrombosis and hypertrophy of smooth muscle cells in walls of pulmonary arteries . Therefore it is evident that TGFβ, and particularly BMP signaling, plays a key role in maintaining the normal homeostasis of smooth muscle cells in pulmonary arteries. It will be interesting to see whether Alk signaling plays a role in the remodeling of the double alveolar capillary network into a single one during erection of alveolar septae. Several studies have shown that TGFβ s are central regulators of pulmonary fibrosis [71, 72]. Interestingly, it has also been shown that TGFβs act as strong anti-inflammatory agents in the lung [73, 74]. Therefore, it is possible that TGFβs contribute to the normal lung repair mechanisms after pulmonary insult, such as inflammation, and that in relatively rare cases this repair process is over-ridden, resulting in life threatening pulmonary fibrosis. Using the experimental mouse model for allergic airway inflammation, it was recently shown that mRNA levels of Alk1 and Alk2 were markedly elevated, while, surprisingly, Alk5 levels were slightly reduced during allergic airway inflammation . It is expected that the mechanisms used during lung development are similar to those utilized during pulmonary repair, which underscores the importance of understanding complex molecular interactions during lung development in vivo. The TGFβ superfamily can be divided into three subfamilies: activin, TGFβ, and BMP . There are three TGFβ isoforms in mammals: TGFβ 1, 2, 3. All of them have been detected in murine embryonic lungs [77–80]. In early mouse embryonic lungs (E11.5), TGFβ 1 is expressed in the mesenchyme, particularly in the mesenchyme underlying distal epithelial branching points, while TGFβ 2 is localized in distal epithelium, and TGFβ3 is expressed in proximal mesenchyme and mesothelium . Mice lacking Tgfβ 1 develop normally but die within the first month or two of life of aggressive pulmonary inflammation. When raised under pulmonary pathogen free conditions these mice live somewhat longer but die of other forms of inflammation . Thus, physiological concentrations of TGFβ 1 appear to suppress the pulmonary inflammation that occurs in response to exogenous factors such as infection end endotoxin. On the other hand Tgfβ 2 null mutants die in utero of severe cardiac malformations, while Tgfβ3 mutants die neonatally of lung dysplasia and cleft palate [82, 83]. Embryonic lung organ and cell cultures reveal that TGFβ 2 plays a key role in branching morphogenesis, while TGFβ3 plays a key role in regulating alveolar epithelial cell proliferation during the injury repair response [84, 85]. Thus, finely regulated and correct physiologic concentrations and temporo-spatial distribution of TGFβ 1, 2 and 3 are essential for normal lung morphogenesis and defense against lung inflammation. Overexpression of Tgfβ 1, driven by the SP-C promoter, in lung epithelium of transgenic mice causes hypoplastic phenotypes . Similarly, addition of exogenous TGFβ to early embryonic mouse lungs in culture resulted in inhibition of lung branching morphogenesis although each TGFβ isoform has a different IC50 (TGFβ 2 > 1 > 3) [49, 87]. In contrast, abrogation of TGFβ type II receptor stimulated embryonic lung branching through releasing cell cycle G1 arrest . Moreover, overexpression of constitutively active TGFβ 1, but not latent TGFβ 1, in airway epithelium, is sufficient to have significant inhibitory effects on lung branching morphogenesis . However, no inhibitory effect on lung branching was observed when TGFβ 1 was over expressed in the pleura and subjacent mesenchymal cells. Furthermore, adenoviral overexpression of a TGFβ inhibitor, Decorin, in airway epithelium, completely abrogated exogenous TGFβ 1-induced inhibition of embryonic lung growth in culture . On the other hand, reduction of decorin expression by DNA antisense oligonucleotides was able to restore TGFβ 1-mediated lung growth inhibition . Therefore, TGFβ signaling in distal airway epithelium seems to be sufficient for its inhibitory function for embryonic lung growth. Interestingly, TGFβ specific signaling elements, such as Smad2/3/7, are exclusively expressed in distal airway epithelium [90–92]. Attenuation of Smad2/3 expression by a specific antisense oligonucleotide approach blocked the exogenous TGFβ 1-induced inhibitory effects on lung growth. Moreover, expression of Smad7 in airway epithelium, which was induced by TGFβ, had negative regulatory functions for the TGFβ-Smad pathway in cultured cells, specifically blocking exogenous TGFβ-induced inhibitory effects on lung branching morphogenesis as well as on Smad2 phosphorylation in cultured lung explants. 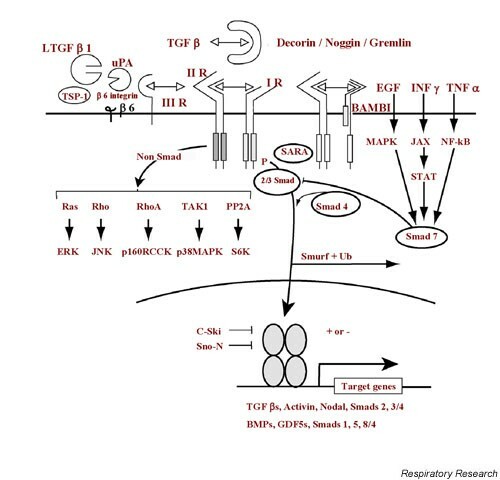 Since blockade of TGFβ signaling not only stimulates lung morphogenesis in culture per se, but also potentiates the stimulatory effects of EGF and PDGF-A, it follows that TGFβ signaling functions downstream of, or can over-ride, tyrosine kinase receptor signaling. During embryonic and fetal life, epithelial misexpression of TGFβ 1 results in hypoplastic branching and decreased epithelial cell proliferation . In contrast, neonatal misexpression of TGFβ 1 using an adenoviral vector approach phenocopies Bronchopulmonary Dysplasia (BPD) with alveolar hypoplasia, some interstitial fibrosis and emphysema (Gauldie and Warburton, unpublished results). Adult misexpression of TGFβ 1, on the other hand, results in a chronic, progressive interstitial pulmonary fibrosis, resulting mainly from increased proliferation and matrix secretion by the mesenchyme; a process that depends on transduction through Smad3 [93, 94]. Thus, the phenotype caused by excessive TGFβ 1 production and signaling is always adverse, but the precise effect depends on the developmental stage of the lung: hypoplasia in embryonic, fetal and neonatal lung, fibrosis in premature and adult lung. Selected key aspects of the TGFβ signaling system are diagramed in Figure 4 and have recently been reviewed (see [55, 95, 96]). Latent TGFβ ligands require proteolytic activation prior to signal transduction by proteases such as plasmin. Expression of β6 integrin and thrombospondin play key roles in TGFβ ligand activation. Bioavailability of activated TGFβ ligand is further regulated by soluble binding proteins such as Decorin, as well as by binding to matrix proteins such as Fibrillin. Cognate receptor affinity for ligand binding may also be modulated by such factors as betaglycan, Endoglin or Decorin. In the case of TGFβ 2 ligand, betaglycan (TGFβ type III receptor) presents activated ligand to the signaling receptor complex and markedly increases ligand-receptor affinity. TGFβ receptors function predominantly as tetrameric transmembrane complexes, comprising pairs of TGFβ type I and II serine threonine kinase receptors. Following dimeric TGFβ ligand binding, the type I receptor kinase is phosphorylated and activated by the constitutively active TGFβ type II receptor kinase. The activated type I receptor serine/threonine kinase phosphorylates the receptor activated R-Smads 2 and/or 3. However, this signal transduction step can be negatively modulated by BAMBI, which functions as a dominant negative, kinase dead TGFβ receptor. BAMBI inhibits TGFβ receptor complex signaling to R-Smads. Phosphorylated R-Smads in turn form a complex with the common effector Smad4. This activated complex then becomes rapidly translocated to the nucleus and activates or represses transcription by binding to specific transcriptional complexes on certain gene promoters such as plasminogen activator inhibitor-1 (PAI-1) and cyclin A respectively. Smad complex stability is negatively regulated by Smurf 1, a ubiquitin ligase. Once in the nucleus, Smad complex mediated gene regulation is antagonized by the transcriptional regulators Sno and Ski. Signal transduction in the Transforming Growth Factor β(TGFβ) family pathway is finely regulated at many levels. Outside the cell latent Transforming Growth Factor β (LTGFβ) is activated by plasmin (uPA) among other unknown extracellular proteases. Thrombospondin-1 and β6 integrin play key roles in assembly and activation of the proteolytic complex. Free TGF β ligand is bound extracellularly and may be sequestered by Decorin. Noggin and Gremlin play similar roles to Decorin, but for Bone Morphogenetic Protein ligands. The TGF β type III receptor (IIIR), also termed betaglycan, presents ligand to the preformed TGF β type I (IR) and type II (IIR) receptor tetrameric signaling complex. This is particularly important with TGFβ 2, where betaglycan substantially increases its binding affinity for the receptor signaling complex. Non Smad signaling pathways activated by ligand binding include Ras-ERK, Rho-JNK, RhoA-p160RCCK, TAK1-p38MAPK and PP2A-S6 kinase. Ligand binding also facilitates phosphorylation and activation of the TGFβ IR serine-threonine kinase domain by the TGFβ IIR serine-threonine kinase domain. TGFβ IR in turn phosphorylates receptor Smads 2/3. The interaction of Smads with the TGFβ IR is facilitated by SARA. BAMBI is a dominant negative, kinase deficient isoform of TGFβ receptor. Smad 7 is an inhibitory Smad that inhibits Smad 2/3 association with Smad4, the co-Smad. Smad7 is a rapidly inducible negative regulator of TGFβ signaling. Phosphorylated receptor Smads 2/3 then associate with the co-Smad4 and translocate to the nucleus, where they coactivate or corepress certain specific target genes by binding to their respective transcription complexes, with or without directly contacting DNA, depending on the promoter in question. Smurf mediate ubiquitination of preformed Smad complexes, thereby negatively regulating Smad signaling to the nucleus. C-Ski and Sno-N are transcriptional factors that negatively regulate Smad activity in the nucleus. The bleomycin-induced model of lung fibrosis is mediated by excessive TGFβ production and signaling. Smad3 null mutation substantially blocks bleomycin-induced interstitial fibrosis . However, the initial phase of lung inflammation induced by bleomycin is not blocked. Moreover, induction of TGFβ 1 expression by bleomycin is not blocked. Rather, the key factor in blockade of bleomycin-induced fibrosis was lack of Smad3 signaling. Thus, Smad3 could act as a final common downstream target in the TGFβ-mediated pathobiologic sequence in the lung. Putative non-Smad signaling pathways provide potential sites for crosstalk with other signaling pathways. The substrates of growth factor receptor kinases are often adapter-proteins, which have no intrinsic enzymatic function but combine with other proteins to activate downstream effectors. An important example is that of the Shc protein family, which comprises three isoforms with different functions. All are substrates of receptor tyrosine kinases . The 52 kDa isoform (p52 Shc ) is a mediator of Ras activation. Upon tyrosine phosphorylation, p52 Shc forms a heterotrimeric complex with Grb2 and Sos, which then translocates to the plasma membrane where it encounters and activates Ras. Ras activation leads to MAP kinase activation and subsequent induction of cell proliferation. A second isoform of 46 kDa is translated from an alternative start site on the p52 Shc transcript; the function of this peptide is incompletely understood. A third isoform of 66 kDa (p66 Shc ) is transcribed from an alternative splice product of the Shc gene, which encodes an additional proline-rich domain to the amino terminus of the p52 Shc . Unlike p52 Shc , overexpression of this isoform neither transforms 3T3 fibroblasts nor activates MAP kinases, but appears to antagonize Ras activation, possibly by sequestering Grb2 and making it unavailable for mitogenic signaling . The 66 kDa protein has also been characterized as a mediator of cellular responses to oxidative damage . Cells deficient in p66 Shc are resistant to cell death following oxidative damage, and mice deficient in p66 Shc have a 30% longer life span. Cellular resistance to oxidation-induced death is reversed by induced expression of the wild-type p66 Shc , and this resistance is regulated by serine phosphorylation at amino acid 36 of p66 Shc . Induced expression of mutant p66 Shc in which the Ser36 has been ablated does not restores the oxidative response of p66 Shc null fibroblasts. Phosphorylation of Ser36 is induced by a number of cellular stresses including hydrogen peroxide, ultraviolet irradiation, and taxol-induced microtubular disruption [100, 101]. Ser36 phosphorylation also occurs in renal mesangial cells following endothelin-1 stimulation, suggesting that the mediated stress response pathway can be induced by intercellular peptide signaling . The p66 Shc and 46 Kda isoforms are differentially regulated towards the end of fetal lung development . Vasculogenesis is initiated as soon as the lung evaginates from the foregut . A critical growth factor during embryonic lung development is VEGF. The loss of even a single allele of Vegf leads to embryonic lethality between days E9.5 and E10.5 in the mouse . VEGF is diffusely distributed in pulmonary epithelial and mesenchymal cells and is involved in controlling endothelial proliferation and the maintenance of vascular structure. VEGF is localized in the basement membrane of epithelial cells . Both humans and mice have three different VEGF isoforms. VEGF-120, VEGF-164 and VEGF-188 are all expressed in mice during development, but VEGF-164 isoform is the most highly expressed and active during embryogenesis. VEGF signals through the cognate receptors Fetal liver kinase-1 (FLK-1) and Fetal liver tyrosinase-1 (FLT-1). VEGF signaling is responsible for the differentiation of embryonic mesenchymal cells into endothelial cells. Interactions between the epithelium and mesenchyme contribute to lung neovascularisation, which is crucial in normal lung formation. In fact, epithelial cells of the airways are positive for VEGF and VEGF is even more expressed at the budding regions of the distal airway . Also, only lung mesenchyme cultured in the absence of epithelium degenerates significantly and only a few Flk-1 positive cells are maintained . Vegf knockout mice have a lethal phenotype within the early stages of embryonic development (E8.5-E9). Whereas in Vegf misexpressing transgenic mice, where the Vegf transgene is under the control of the SP-C promoter, gross abnormalities in lung morphogenesis are associated with a decrease in acinar tubules and mesenchyme . VEGF treated human lung explants show an increase of cellular proliferation in the distal airway epithelial cells with up regulation of the mRNA expression of Surfactant Protein-A (SP-A) and C (SP-C) but not SP-B . VEGF has also been demonstrated to play a role in maintaining alveolar structure . Lungs from newborn mice treated with antibodies to FLT-1 were reduced in size and displayed significant immaturity with a less complex alveolar pattern . In contrast the accumulation of VEGF in the alveoli appears to make transgenic VEGF mice more resistant to injury by hyperoxia [110, 111]. VEGF is a target of hypoxia-inducible transcription factor-2α (HIF-2α). Hif-2α deficient newborn mice die from respiratory distress syndrome . In Hif-2α null mice the expression of VEGF is dramatically reduced in alveolar epithelial type 2 cells. Additionally we have recently noted that addition of VEGF in early mouse embryonic explants in culture markedly stimulates epithelial as well as vascular morphogenesis (unpublished results). Thus we speculate that VEGF signaling plays an important role in matching the epithelial-capillary interface during lung morphogenesis. VEGF-C and VEGF-D are two additional members of the VEGF family. These factors have a restricted expression pattern, with high levels mainly in lung tissues . VEGF-C and -D stimulate lymphoangiogenesis through their cognate receptor VEGFR-3 . Signaling via VEGFR-3 has been shown to be sufficient for lymphoangiogenesis through null mutation. . Finally, VEGF-C also interacts with VEGFR-2 and is therefore able to induce angiogenesis in vivo . Thus, VEGF isoforms induce vasculogenesis, angiogenesis and lymphoangiogenesis during lung development and likely play a key role in coordinating epithelial morphogenesis with the developing vascular and lymphatic capillary circulations. The linked concepts of "morphogens" and "morphogenetic gradients" were coined by Morgan over a century ago to provide a theoretical basis for pattern formation during morphogenesis . The morphogen concept was advanced by Spemann's classical observation of an "organizer" within the dorsal tip of the blastopore in early Xenopus embryos, whose activity is mediated by a diffusible "morphogen" . A mathematical theory explaining how two morphogens might interact to determine form during organ development was proposed by Alan Turing, the World War II Naval Enigma code breaker . His mathematical reaction-diffusion hypothesis states that two homogeneously distributed substances will interact to produce stable patterns during morphogenesis and will thus induce an ordered structure out of a randomly chaotic system . This provides a potential clue to solving the biological enigma of repetitive branching. The discovery that morphogens, specifically peptide growth factors, can instruct lung morphogenesis through tyrosine kinase signaling, and hence gene induction in target cells, supports Turing gradients as a possible mechanistic solution to lung morphogenesis . However, while binary reaction-diffusion systems may be adequate to explain relatively simple repeating patterns, it now seems likely that in the lung dual parameter reaction-diffusion is an over simplification. Instead, in more complex polydimensional biological systems such as the lung, we must consider how the several diffusible ligands mentioned herein may set up repeating morphogenetic fields. Further, as discussed above, the bioactivity of each single morphogen is simultaneously modified by its own system of checks and inducible balances such as the binding proteins and the negative Smads in the BMP signaling pathway and the Spry gene family in the FGF pathway. Moreover each of these pathways can respectively positively and/or negatively regulate its fellows through intracellular signaling cross talk. The developing limb bud is another well-studied system where morphogen gradients such as certain FGF ligands arising from the distinct apical ectodermal ridge (AER) have been proposed to initiate proximal-distal patterning of the long bones as well as antero-posterior patterning of the digits. Long bone and wrist bones are postulated to arise respectively, based upon the time progenitor cells spend and their orientation within the "progress zone" subjacent to the AER . To the extent that the lung has a recognizable proximal-distal pattern to the airways and alveoli, it is tempting to speculate that inductive and progress zones may also exist in the peripheral lung during morphogenesis. We have recently noted that the peripheral domain of FGF10 expression at the edge of embryonic lung lobes bears a striking resemblance to the domain of FGF expression in the limb AER. Thus it is tempting to speculate that the FGF10 domain in embryonic lung may form an Apical Pulmonary Ridge (APR), which has a pattern forming function analogous to that of the AER in the limb . The decision of the embryonic airway to branch or not to branch is therefore determined by the integration of multiple peptide growth factor mediated as well as other kinds of signals within automatically repeating morphogenetic signaling centers. This novel concept is diagramed schematically in Figure 5. Morphogenetic "Turing" gradients and some of their major regulators in murine early airway branching. This conceptual figure shows some of the key morphogens and their major regulators diagramed as putative "Turing" gradients, within a branching early embryonic mouse lung lobe. In the bottom panel, both lateral (monopodial) and terminal (dipodial) epithelial branches are diagramed, within a coating of mesenchyme and pleura. In the 5 panels shown above this one, concentrations or activities of key morphogens and their respective regulator molecules are shown as arbitrary relative expression/activity "Turing" gradients. In the top panel Fibroblast Growth Factor10 (FGF10) is shown as a solid line. The FGF10 "Turing" gradient is highest near the pleura and its concentration/activity gradient decays through the peripheral mesenchyme and forms an asymmetrical gradient across the distal bipodial branch induction domain. FGF10 then remains low until it peaks once more within the proximal monopodial branch induction domain. The expression/activity of mSPRY2, shown as the dotted line, is induced by FGF10 within the epithelial branch tips. In contrast, the expression/activity of mSPRY4 peaks in the peripheral mesenchyme and in the mesenchyme between the branch tips. The net result is that FGF10 expression/activity is powerfully negatively regulated between branches, but is increased within branch tips. FGF10 expression/activity is symmetrical within monopodial branch tips, but within dipodial distal tips it is asymmetrical. We suggest that the relative symmetry of the FGF10 expression/activity "Turing" gradient may play a key role in determining whether a specific branch will be mono or dipodial. Also the relative activity of FGF10 and mSPRY2 may play a key role in determining interbranch length and setting up subsequent branch points. In the second panel, SHH is shown as the hatched line and HIP is shown as the solid line. The sharp induction of Hedghog Interacting Protein (HIP) within the branch tips serves to inhibit Sonic hedghog (SHH) expression/activity. As noted in the text, SHH expression/activity is highest in between branch tips, i.e. in places where branches are not supposed to occur. SHH likely plays a major role in negatively regulating FGF10 expression/activity at these inter-branch sites. Conversely, negative regulation of SHH expression/activity by HIP may facilitate FGF10 expression/activity at points where branches are genetically programmed to arise. In the third panel, Bone Morphogenetic Protein4 (BMP4) expression/activity is shown as the solid line. BMP4 expression/activity is relatively low between branches but is increased at branch tips. The activity/expression of Noggin, shown as the dotted line, is the inverse of BMP4. Noggin expression/activity is high between branches and low at branch tips. Gremlin expression/activity is shown as the hatched line. Gremlin follows the contour of BMP4. Thus, the net BMP4 concentration/activity "Turing" gradient peaks in branch tips and is relatively suppressed between them. BMP4 signaling elements however show a more complicated picture. In the fourth panel BMP Smads 1 and 5 concentration/activities are shown. Smad1 peaks within branch tips and is low between them. Smad 5 on the other hand is expressed within small clusters of cells out in the mesenchyme. In the fifth panel, Transforming Growth Factorβ 2 (TGFβ 2) is shown as the solid line, while its signaling Smads 2, 3 and 4 are shown together as the hatched line. TGFβ 2 expression/activity is quite widespread throughout both mesenchyme and epithelium, but peaks within branch tips. Smads 2, 3 and 4 peak within branch tips. Therefore it is likely that TGFβ 2 only signals to any significant extent within branch tips. We suggest that morphogenesis of the branching airway is determined by genes responding to the hard wired temporospatial net integration of the "Turing" gradient distribution of the above morphogens and probably others as well. This conceptual framework represents our latest model for considering this hypothesis. A noteworthy predictive feature of this model is the shape of the FGF10 morphogenetic gradient as it decays proximally away from the high level source of FGF10 in the APR. As diagramed, the model predicts that in monopodial lateral branches, such as the lobar bronchial buds at E11, the decaying FGF10 gradient will be symmetrical. In contrast, in the bipodial branch sites at the periphery, the decay of the FGF10 will be asymmetrical. Thus we speculate that the shape of the FGF10 morphogen gradient may play an important role in determining monopodial versus dipodial branching and hence stereotypy of the proximal airway branches. The model also predicts that the dynamically changing relative activity of SHH, FGF10 and mSPRY2 may impart automaticity to the branching process. SHH is high and FGF10 is low where branching is not supposed to take place. In contrast, SHH is suppressed locally by PTC and HIP, so that FGF10 is therefore high where a branch is supposed to occur. FGF10 in turn dynamically induces its inhibitor mSpry2 as branches lengthen. Thus, the net relative activities between SHH, FGF10 and mSPRY2 may determine FGF signal strength in the epithelium and hence the relative rate of bud outgrowth rate at a given point and hence inter-branch length. The temporospatial relationship between Fgf10 and mSpry2 during bud outgrowth and branching is diagramed in Figure 6. Fgf10 is expressed locally in the mesenchyme close to a point where a branch will arise from the main epithelial bronchial stem. As the bud begins to elongate, mSpry2 begins to be expressed in the distal tip. During subsequent elongation, Fgf10 continues to be expressed in the distal mesenchyme and the level of mSpry2 gradually increases as the bud lengthens. When the bud finally approaches the pleura, the Fgf10 expression domain adjacent to the distal tip appears to thin out and some of it appears to be pushed laterally to lie between adjacent branch tips. At this time mSpry2 expression in the distal tip is at its highest level, and this may mediate bud outgrowth arrest. A tip-splitting event then occurs. Of note is that mSpry2 expression is extinguished between the daughter bud tips, but continues to be expressed within the tips of the daughter bud epithelia. This cycle of interaction is then repeated during subsequent branching events. Schematic diagram drawn after Mailleux et al, 2001, ofFibroblast growth factor 10(Fgf10) and murineSprouty2(mSpry2) expression respectively adjacent to and within the epithlium of an epithelial branch tip in the periphery of an early embryonic mouse lung. In panel a., Fgf10 is beginning to be expressed in the mesenchyme at a point where a bud is about to arise. Note that there is a gap between the epithelium and the locus of Fgf10 expression. At that time mSpry2 is either not expressed or is expressed at low levels. In panel b., an epithelial bud has begun to arise and is moving towards the chemoattractive source of FGF10 located in the mesenchyme near the adjacent pleura. At this time mSpry2 expression is increasing within the distal epithelial tip. In panel c., the bud has extended to a point close to where it will begin to branch. The Fgf10 expression domain is beginning to spread out towards the sides of the tip and mSpry2 is expressed at a high level. In panel d., the bud is extending into the Fgf10 expression domain, which has by now thinned between the bud tip and the adjacent pleura and extends downwards on either side of the bud tip between it and the adjacent bud tips (not shown). The level of mSpry2 expression within the bud tip epithelium is now high and the bud has stopped extending and is about to split. In panel e., a tip-splitting event has occurred and the two daughter buds have just begun to diverge towards the lateral sources of FGF10 expression. The expression of mSpry2 continues within the daughter bud epithelial tips, but at a lower level. It should be noted that the expression ofmSpry2 is extinguished between the two daughter bud tips, implying that FGF10 signaling is no longer inducing mSpry2 at the latter location. This pattern of bud extension and gene expression is then repeated as the bud tips migrate towards the band of Fgf10 expression located along the edge of the primitive lobe, which we have termed herein the APR or apical pulmonary ridge. These hypothetical models do potentially explain automaticity and symmetry of early airway branching, but they do not explain stereotypy, antero-posterior orientation or left-right laterality. We speculate that proximal-distal, antero-posterior and left-right stereotypy must be superimposed on the automatic morphogenetic branching mechanisms just proposed. Hox family genes are likely to play a key role in this process, since in Hoxa-5 -/- mice, tracheal occlusion and respiratory distress is associated with marked decrease in surfactant protein production together with altered gene expression in the pulmonary epithelium . Since Hoxa-5 expression is restricted to the lung mesenchyme, the null mutant phenotype strongly supports the inference that Hoxa-5 expression is necessary for induction of epithelial gene expression by the underlying mesenchyme. Could Fgf10 be a Hox gene target? Likewise, retinoic acid receptors, Gli-2, Lefty-1, Lefty-2 and Nodal are preferentially expressed on the left side of wild type mouse embryos and are implicated in determination of left-right laterality. Lefty-1 null mutant mice show a variety of left-right isomerisms in visceral organs, but the most common feature is thoracic left isomerism. The lack of Lefty-1 expression results in abnormal bilateral expression of Nodal, Lefty-2 and Pitx2 (a homeobox gene normally expressed on the left side). This suggests that Lefty-1 normally restricts Lefty-2 and Nodal expression to the left side, and that Lefty-2 or Nodal encode a signal for "leftness" in the lung . Further investigation will be required to discover the full complement of additional components of the "hard wiring" in the genetic program that determines stereotypy, antero-posterior and lateral symmetry of lung branching. A good start was recently made using differential gene expression comparing proximal versus distal endoderm of E11.5 embryonic mouse lung . Among the 20 genes identified as being preferentially transcribed in distal endoderm, Erm an Ets-related transcriptional factor of the Pea3 subfamily looks like an interesting candidate.